Born in Chicago, Illinois, Mayfield started his musical career in a gospel choir. Moving to the North Side he met Jerry Butler in 1956 at the age of 14, and joined the vocal group the Impressions. As a songwriter, Mayfield became noted as one of the first musicians to bring more prevalent themes of social awareness into soul music. In 1965, he wrote "People Get Ready" for the Impressions, which displayed his more politically charged songwriting. Ranked at no. 24 on Rolling Stone's list of the 500 Greatest Songs of All Time, the song received numerous other awards, and was included in the Rock and Roll Hall of Fame 500 Songs that Shaped Rock and Roll, as well as being inducted into the Grammy Hall of Fame in 1998. 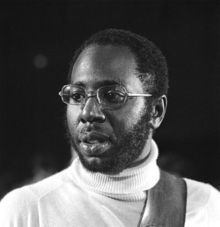 Curtis Mayfield was born on June 3, 1942, in Chicago, Illinois, the son of Marion Washington and Kenneth Mayfield and grew up one of five children in an impoverished family. Mayfield's father left the family when Curtis was five; his mother moved the family into various Chicago projects before settling at Cabrini–Green when he reached his teenage years. Mayfield attended Wells Community Academy High School until dropping out his sophomore year. His mother taught him the piano, and she, along with his grandmother encouraged him to enjoy gospel music; when he was seven he was a singer with the gospel quintet, the Northern Jubilee Gospel Singers. When he was 14 years old he formed the Alphatones when the Northern Jubilee Gospel Singers decided to try their luck in the heart of Chicago. Fellow group member Gooden was quote "It would have been nice to have him there with us, but of course, your parents have the first say." Mayfield stayed behind. When he was 14 he joined his school friend Jerry Butler's group the Roosters in 1956, with Arthur and Richard Brooks. He wrote and composed for this group who would become the Impressions two years later. Along with Marvin Gaye's What's Going On and Stevie Wonder's Innervisions, this album ushered in a new socially conscious, funky style of popular soul music. He was dubbed 'The Gentle Genius'. The single releases "Freddie's Dead" and "Super Fly" both sold over one million copies each, and were awarded gold discs by the R.I.A.A. In 1980, Mayfield decided to move to Atlanta with his family, closing down his recording operation in Chicago and effectively ending the era of the Chicago soul sound. The label had gradually reduced in size in its final two years or so with releases on the main RSO imprint and Curtom credited as the production company. Mayfield continued to record occasionally, keeping the Curtom name alive for a few more years, and to tour worldwide. Mayfield's vocals were recorded, usually line-by-line, while lying on his back. Mayfield's last appearance on record was with the group Bran Van 3000 on the song "Astounded" for their album Discosis, recorded just before his death and released in 2001. Mayfield died from complications of type 2 diabetes on December 26, 1999, at the North Fulton Regional Hospital in Roswell, Georgia. His health had steadily declined following his paralysis. Mayfield was nominated for Song Of The Year with "Same Love", performed by Macklemore and Ryan Lewis featuring Mary Lambert, on the 56th Grammy Awards due to the duo sampling the piano from "People Get Ready". Mayfield taught himself how to play guitar, tuning it to the black keys of the piano, giving the guitar an open F-sharp tuning that he used throughout his career. He primarily sang in falsetto register, adding another flavour to his music. This was not unique in itself, but most singers sing primarily in the modal register. [clarification needed] His guitar playing, singing, and socially aware song-writing influenced a range of artists, including Jimi Hendrix, Bob Marley, Tracy Chapman, Sly Stone, Marvin Gaye, Stevie Wonder and Sinead O'Connor. ^ a b Curtis Mayfield, Rock and Roll Hall of Fame and Museum. "…significant for the forthright way in which he addressed issues of black identity and self-awareness. …left his imprint on the Seventies by couching social commentary and keenly observed black-culture archetypes in funky, danceable rhythms. …sounded urgent pleas for peace and brotherhood over extended, cinematic soul-funk tracks that laid out a fresh musical agenda for the new decade." Accessed November 28, 2006. ^ "500 Songs That Shaped Rock". Infoplease. Retrieved 9 February 2015. ^ June Skinner Sawyers (31 Mar 2012). Chicago Portraits. Northwestern University Press. p. 208. ^ Craig Werner (18 Dec 2007). Higher Ground. Random House. p. 30. ^ Ian Hill (25 March 2013). "Curtis Mayfield (1942-1999)". New Georgia Encyclopedia. Curtis Mayfield is not currently on tour.